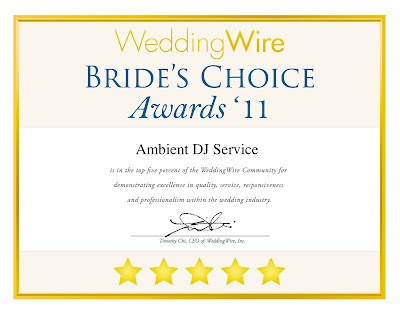 East Windsor, NJ – January 28, 2011 - WeddingWire, the nation’s leading wedding technology company, is thrilled to announce Ambient DJ Service has been selected to receive the prestigious annual WeddingWire Bride’s Choice Awards™ 2011 for Wedding Disc Jockey Entertainment! 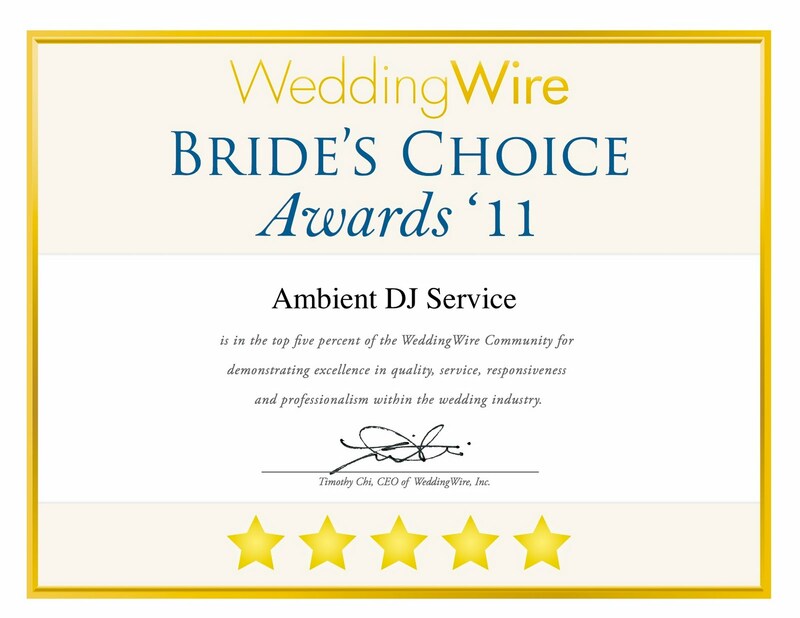 Ambient DJ Service stands among the top five percent of wedding professionals in the WeddingWire community, representing quality and service excellence within the wedding industry. Awards were given to the top wedding professionals across 20 service categories, from wedding venues to wedding photographers, and were based on the overall professional achievements throughout the past year. We are happy to announce that Ambient DJ Service is among the very best Wedding Disc Jockey Entertainers within the WeddingWire Network, which includes leading wedding planning sites WeddingWire, Martha Stewart Weddings, Project Wedding and Weddingbee. We would like to thank our past clients for nominating us to receive the Bride’s Choice Awards™ 2011. Ambient DJ Service President, Gregg Hollmann, said "We are honored to receive this prestigious award for the second consecutive year. I would like to thank the clients who took the time to review our services on WeddingWire. I would also like to thank the Ambient DJ staff for their hard work and attention to detail. We look forward to delivering a superior quality service to the bridal community in the years to come!" For more information, please visit our WeddingWire Storefront today at www.weddingwire.com/ambientweddingdj. Congrats for winning the award. Its the certification that proves you the best dj services provider.